We celebrated Adam's 6th birthday this year at the Bowling Alley. He went to his good friends party a month prior to his b-day and decided he no longer wanted his party at Chuck E. Cheese, but at the bowling alley. After I asked my dear friend Alyson to make Adam's invites and we were addressing them he decided to change his mind and would now like to have it at Chuck E. Cheese again. When I explained that wasn't an option, he proceeded to tell me that he wanted to go to Chuck E. Cheese because "that's where a kid can be a STAR". 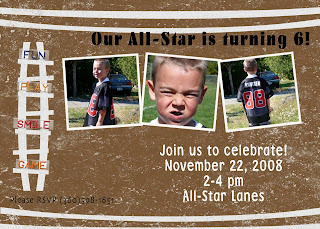 After I explained that the bowling alley would also make him feel like a star he conceded and we had his party there with 10 of his BEST FRIENDS and had a great time. In honor of Adam's 6th birthday I thought I would copy one of my favorite blogs and list 6 things I love about Adam. 2. His ability to love. He shows such love to all of us and receives the same in return. 3. His willingness to learn. He is in Kindergarten this year and is excited to come home and share what he has learned, whether is it reading, math or new songs from music time. 4. His excitement. If you've ever watched Adam play Wii or watch an exciting program on TV you know what I mean. He does this funny little dance in which he jumps, screams and his thoroughly excited. 5. His prayers. He has the sweetest prayers I've ever heard for a 6 year old. The other day he prayed for all the men and women serving in the military and prayed that they would be home in 5 weeks. 6. His ability to teach me continued patience, tolerance and LOVE. He always shows such unconditional love that it reminds me that I need to practice the same. Every day I wake up and know that I want to be a better mom to my 3 wonderful children. Happy Birthday Adam! My wish for you is that always know how very much you are loved. We look forward to another year with you and all the possibilities that it brings. With a little more free advertising, I may just start my own business! I can't believe he's 6...the time flies. I'm so glad he had a fun birthday, and hopefully he did feel like a star!! !